What's The Worst Super Car? It's been a super car lovefest with both the 2010 Mercedes SLS AMG and McLaren MP4-12C breaking cover, reminding us of beloved chariots of the past both good and bad. That got us thinking — what's the worst super car? 2010 Mercedes SLS AMG: First Photos, Details! 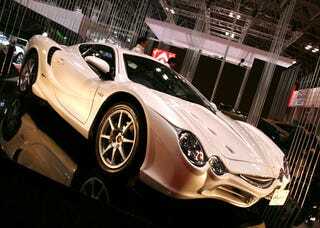 We have to credit Mitsuoka on the Orochi for their sheer audacity in the face of all decorum or common sense. This is where the compliments end. The Orochi is, and may forever be, the ugliest car on the planet. It's fish-like body sculpting reminds us more of a villainous puppet from Labyrinth than a super car, and the 3MZ-FE V6 six-cylinder engine doesn't exactly scream performance. The price isn't bad for a super car — around $100K — but the 230 HP is. For almost the price of a ZR1 you could have something even uglier and less sporty than a Solara.